Diario Nacional, May 12, 2010 language source: Tetun - MP Maria Exposto from the Social Democratic Party (PSD) has said that local residents of Ermera district were afraid to pick their coffee due to the recent rumors saying that there were illegal weapons in the area. 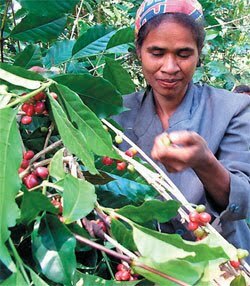 “This is the time for Ermera residents to pluck coffee but they are afraid to conduct their activity due to the recent widespread information that there are illegal weapons in their district,” MP Exposto said. MP Exposto also called on the Government to send an investigation team to the area in order to investigate this case immediately, so that people can undertake their work without fear. “I am calling on the Government to create a team and send them to the area to investigate this case immediately in order to know whether rumors about illegal weapon are true or not otherwise residents will continue living in a fearful situation,” MP Exposto said.